Solid pathway ramps are the perfect addition to areas such as walkways that are divided by a single step or interior landings with only one or two steps that obstruct wheelchair and scooter travel. Installing these as temporary or semi-permanent accessibility aids is easy - just drop the ramp in place and it's ready to use! 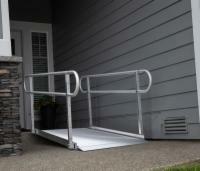 Contact an AmeriGlide mobility expert today to order your solid pathway ramp in whatever size you need!